Jin-Kyu Koh is the Director of Dykema's Business Services Department, as well as the Leader of the Korean Business Team. He is a former Office Managing Member of the Detroit office and the former Leader of the Corporate Finance Practice Group. Mr. Koh has extensive experience in mergers and acquisitions of both public and private companies. He regularly represents companies in a wide range of financing transactions, including private and public offerings of equity and debt securities, secured and unsecured debt facilities, and angel and venture capital financings. Mr. Koh also provides general corporate representation to many of the Firm's casino gaming, biotechnology and life sciences, information technology, sports and entertainment, financial institution and Asian-based clients. 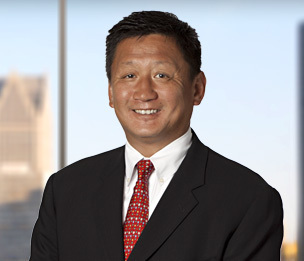 Prior to joining Dykema, Mr. Koh worked at a large international New York-based law firm focusing on mergers and acquisitions and regulatory matters involving financial institutions and communications-related companies. Mr. Koh is a frequent speaker and writer on corporate finance matters, including mergers and acquisitions, venture capital financings, private placements, cross-border transactions, corporate governance and business ethics. Sale of Tissue Business to Stemgent, Inc.
Sale of Citizens Bank Illinois, National Association to Metropolitan Bank Group, Inc.
Acquisition of dynaTrace Software, Inc.
Acquisition of BEZ Systems, Inc.
Health Alliance Plan of Michigan, Inc.
Acquisition of Midwest Health Plan, Inc.
Palace Sports and Entertainment, Inc.
Acquisition of Angstrom Medica, Inc.
Equity investment in Glocal, Inc. Doing Business in Korea and With Korean Companies in the U.S.
"Current Trends in Deal Structures"
"Venture Capital Directors - The Heightened Risk of Serving More Than One Master"
"Three Tips for Avoiding Small Business Pitfalls"
"Sarbanes-Oxley Is Not Just For Public Companies These Days"
"Private Companies Toe the SOX Line"